Role in your wardrobe: Spectacular or Everyday Luxury? You have two choices here. Do you want a Spectacular or an Everyday Luxury? A Spectacular is a special occasion accessory designed to accompany a specific ensemble. Have you been invited to a wedding? A gala fundraiser? Do you have a special outfit or a beautiful dress you would like to enhance? Accessories to accompany these outfits are showstoppers calculated to get you noticed! Contact me, and I will create a custom design, just for you. An Everyday Luxury is a more versatile, day-to-dinner accessory equally at home with evening or daywear. You can wear lace with your little black dress, your business suit—even your jeans! If you would like an everyday luxury, explore your options by using the wizard. Wearing qualities: Floaty, slinky, or cozy? The accessories are crafted from soft lace-weight fibers that will feel wonderful next to your skin: kid mohair, baby alpaca, or merino wool, many of them blended with silk for extra luxury and shine. Each fiber has its own texture and appeal. If you want a light-as-air accessory that floats about you when you move, choose kid mohair. This softly brushed yarn is all air, like the sea foam churned up by the mermaids. You can’t imagine anything more graceful and romantic. It’s like wearing a cloud. If you like the idea of a silky, slinky fabric, choose alpaca. 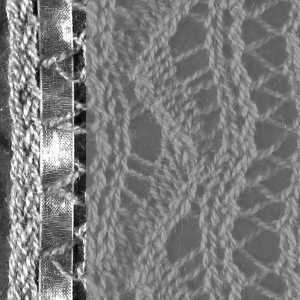 This dense yarn, very warn for its weight, drapes beautifully. A long, drapey alpaca scarf, wound once around your neck, will make you feel as if you just stepped out of the roaring 20’s. If you want your accessory to hug your throat or shoulders like your favorite wool sweater, choose merino. Wool is the traditional fiber for scarves and shawls, evoking the misty outer islands of Scotland and Ireland. Merino, however, is a special wool. During the Renaissance in Spain, the Merino sheep was bred to yield soft-to-the-skin wool, prized by royalty. (No itchy coarse wool for them!). The Merino sheep was so valued that it was a capital offense to smuggle one out of the country. Yarn: Kid mohair, baby alpaca, or merino? 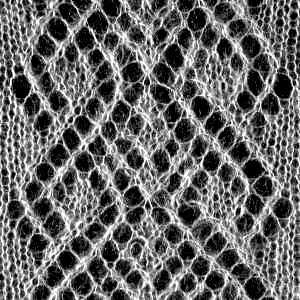 Your accessory will be made from a natural fiber yarn: only natural fibers will hold a shape after blocking in order to reveal the beauty of the lace patterning. 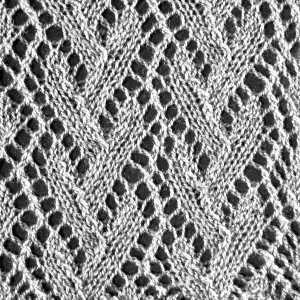 The same lace pattern will look very different, depending on the yarn from which it’s made. Keep that in mind as you look at the swatches. 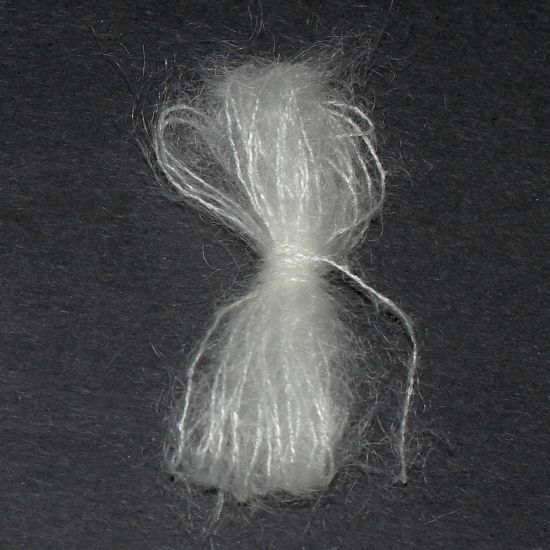 Kid mohair is combed from the hair of an angora goat two years old or younger. The yarn is usually brushed to raise a nap, which creates a soft halo over the finished article. It is often blended with silk or rayon to add luster and strength. As you can see from the image, the yarn is quite fuzzy. Garments made from kid mohair are frothy and romantic. Baby alpaca comes from the first clipping of an alpaca, a Peruvian camelid now widely raised in this country. Baby alpaca is almost as soft as cashmere and warmer than sheep’s wool of a comparable weight. In contrast to mohair, alpaca is a slippery yarn without stretch. 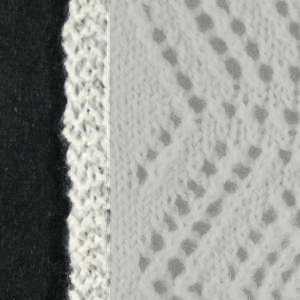 A stitch pattern will have better definition in alpaca than in mohair. As you can see in the image, this yarn is less fuzzy and better defined, but becomes slightly fuzzier in time. Alpaca makes very sophisticated garments. Fleece from the merino sheep is the softest of all wools. Unlike alpaca, merino yarns are springy, and the resulting fabric has lots of stretch. Merino yarn is the perfect choice when you really want the pattern itself to be highlighted and when you want a crisp, tailored garment. 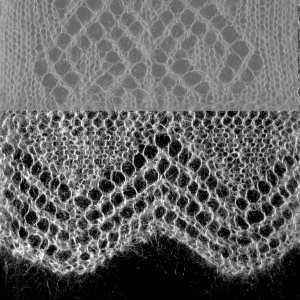 Lace patterns show up much more clearly in merino than they do in mohair or alpaca. 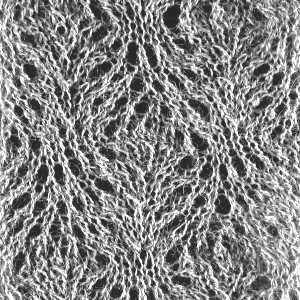 You can see the smoothness of this yarn in the image. I use mohair, alpaca, and merino because they are luxurious, available in a wide range of colors, and moderately priced. 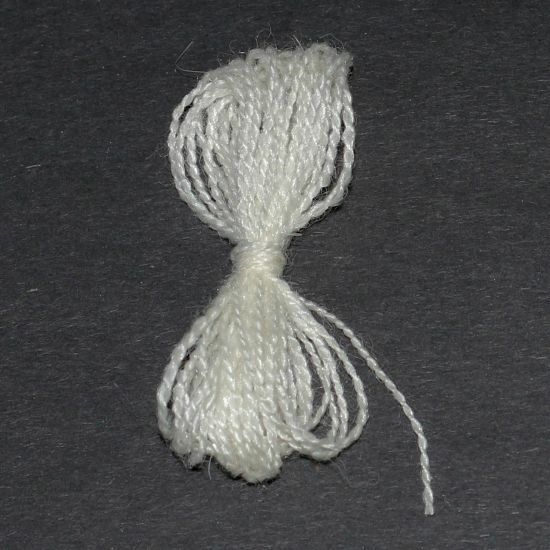 Other precious fibers also work well in lace, but they are very expensive, such as cashmere, quiviut (combed from the hair of the Arctic musk ox), and vicuna (another Peruvian camelid). One skein of undyed vicuna costs $600! However, if you have your heart set on a garment from a specialty fiber, I am happy to oblige. 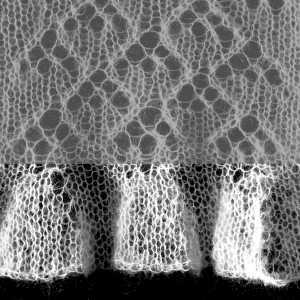 Lace is all about the creation of pattern. 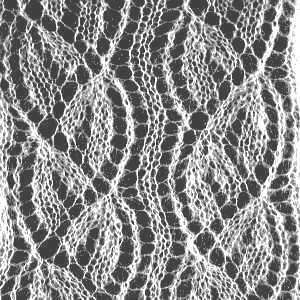 There are literally hundreds of lace patterns, and new designs are being created every day. Because all of this can be bewildering, I’ve selected several beautiful patterns for you to choose from. As as time goes on, I will share more patterns with you. This is THE most feminine, romantic pattern I offer; note how the rows of flowers undulate softly. This is an example of a large family of patterns called twigs or trellises. 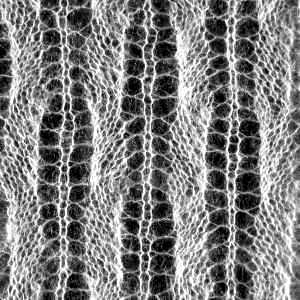 Whatever you call it, its vine-like lines evoke the natural world. 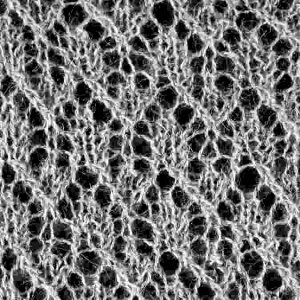 This pattern is denser than most lace fabrics. Waves are its distinguishing characteristic. Note how the stitches wave and curl into each other. In fact, the entire garment will wave: softy along the long edges, deeply along the short. This ribbon pattern creates strong vertical lines along the length of the garment. However, the resulting design is very graceful, since the ribbons do not line up in rigid columnar formations. Depending on your choice of yarn, this pattern can be either tailored or romantic. The deep, wave-like curves along the vertical lines make this pattern seem especially edgy and modern. Given its character, it seems unsuitable for romantic mohair yarns. It would be striking in a rich, jewel-tone wool, set off by a plain edging. This small allover diamond repeat is perfect for the tailored woman who appreciates the romance of lace but prefers simple elegance to froufrou. Here is another small allover repeat, with an openwork diamond pattern. This small allover pattern can be anything you want it to be—romantic or tailored, depending on your choice of yarn, color, and embellishment. 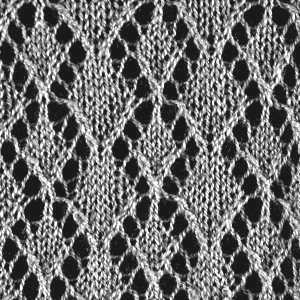 This traditional pattern creates an openwork design on a background of plain knit fabric. It is exquisite make in a frothy white mohair yarn. However, when made in wool or alpaca, it looks rather like Neptune’s trident. For the perfect finishing touch, select an elegant edging to frame the lace pattern you have chosen. 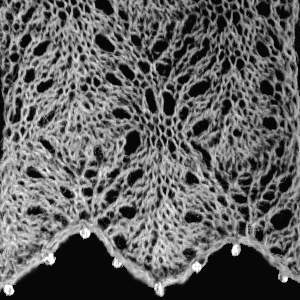 In general, the more complex the lace pattern, the simpler the edging can be; the simpler the pattern, the more complex the edging. Ornate patterns like Dayflower need only a ruffle or a narrow four-sided edging to set them off. 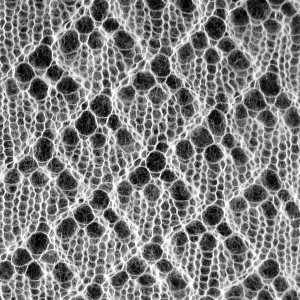 Simple patterns, like Scales, look wonderful with wide, fancy edgings. Caution: any openwork edging may have a tendency to get caught in things, so you’ll want to be careful where you sit (and of course, never wear loose clothing when working around machinery). If you’ve ever worn a scarf with a long fringe, you know exactly what I’m talking about. However, most of the edgings described below have much less tendency to tangle than does the traditional scarf fringe. Four-sided Edgings - These narrow edgings travel all around your rectangular wrap or scarf. 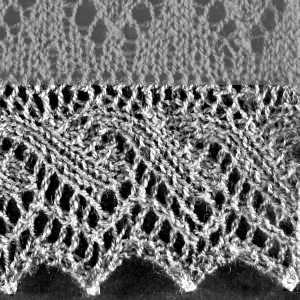 Sometimes, all you want is a simple knitted edging to set off the beauty of the main lace pattern. Another advantage: this smooth, all-around border resists the impulse to tangle in things. Delicate picot crochet makes a subtle, feminine edging. The leaf-like structure of this edging echoes the floral theme of many lace patterns. 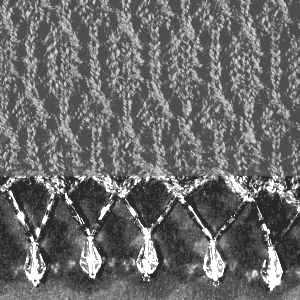 Two-sided Edgings - Rectangular wraps and scarves can be highlighted by a wide border at each of the short ends, instead of a narrow 4-sided border. 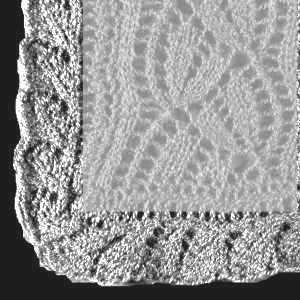 This traditional border echoes the shape of the wide lace collars popular during the 17th century. (Think 3 Musketeers!). Its deep points create a dramatic focal point for your accessory. This border also features deep, dramatic points. However, in overall appearance, it is less symmetrical, more “natural”, than the VanDyke. It is shown on the right with the optional crystal drops along the edge at each point. A ruffled border lends a feminine flourish to the two short ends of a scarf or wrap. A combination of pendants and seed beads add a dramatic flourish to the two ends of a scarf or wrap. Choose this edging if you plan to wear your accessory in circumstances where it will catch the light—either full sunlight or dramatic evening lighting. Beads also add extra weight, making the garment move differently. Caution: Like the traditional scarf fringe, beads are tanglers. Beaded scarves and wraps work best over smooth garments. If you put a beaded scarf over a button-front blouse, you are asking for trouble! Swarovski crystals catch the light for an understated but beautiful embellishment. Because the drops are small, they have less of a tendency to tangle than the full beaded fringe. However, do be mindful of the above caution. 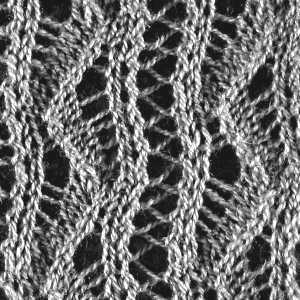 A ribbon or a contrasting yarn can be woven through the openwork holes in the pattern to highlight the long edges of a wrap or scarf. Color: Bold, subtle, or sparkley? At a recent business showcase, two women expressed amazement at the range of colors of the pieces in my inventory. 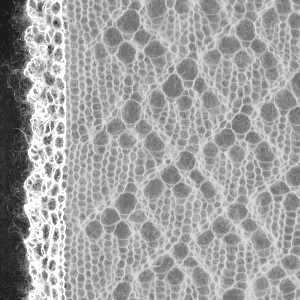 To them, “lace” had always been synonymous with “white” and “ecru”. No more. Thanks to the magic of the internet, almost any color you can imagine is available in lace-weight mohair, alpaca, and merino yarn: primary colors, hot colors, pastels, jewel tones, neutrals. Thus you can always choose a lace piece that will coordinate well with your favorite colors and with the colors already in your wardrobe. At first glance, a heather yarn may look like a single color, but on closer inspection you see that it is in fact a blend. For example, the swatch appears to be blue, but looking closely, you see a riot of colors: not only blue but pink, lavender, and white. Heathers create fabrics with depth and movement and always work up beautifully in lace. Heathers are not as universally available as solids, but there is a range of heathers in all three yarn types. Hand paints are enormously popular today. Unlike blended heathers, they are dyed so that they shade from one color to another along the length of the strand. Some hand paints can be very effective in lace, especially when there are subtle rather than broad differences in the colors used. This pale lavender hand paint is a beautiful example. 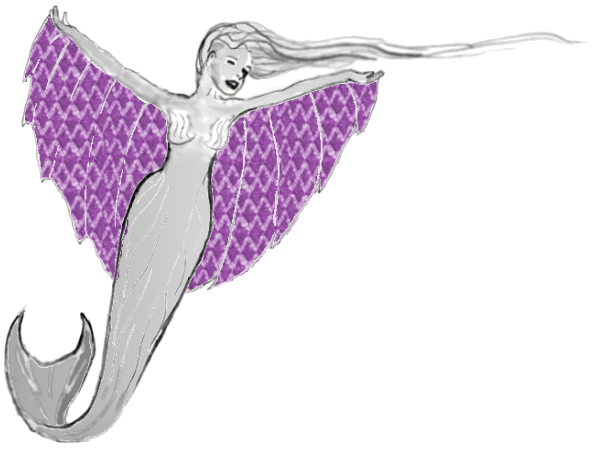 It works because the lavender, pink, and blue are close in hue and value. The color shading is distinct yet understated and does not detract from the clarity of the lace patterning. This alpaca and silk hand paint has a wider range of shades; the colors vary in hue from pale peach to dark peach to tan and brown. The lace patterning can still be seen though not as clearly as in the lavender swatch because the hand-paint yarn creates diagonal stripes of color along the length of the scarf. If you like the effect of a hand-paint yarn, please let me help you choose. Many of them—especially ones with extreme color changes-- look better in the skein than they do in a finished product, where they are prone to “pooling”, creating unattractive and unpredictable color blops. Like heathers, hand paints are less widely available than solids but can be found in all kinds of yarn. 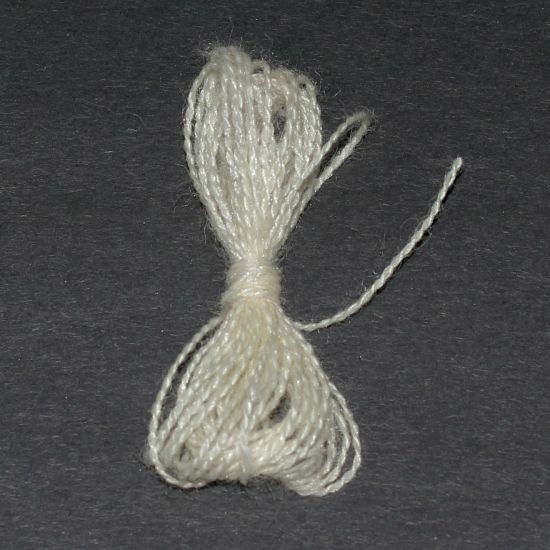 Some kid mohair yarns have built-in sparkle, usually created by a strand of nylon or polyester twisted with the main yarn. Notice how the hint of sparkle transforms this pale pink mohair into a yarn that is perfect for an evening accessory.